Last weekend was wonderful! It had been 2 very long weeks since Amara spent the night and we did our best to stuff it full of memories! We read books, we played on the swings and she even practiced her typing while I cooked dinner. Her elementary school has an awesome website and a link to Dance Mat typing. She will be doing her own posts before you know it! For movie night we watched the (original) Parent Trap. Amara liked it but not nearly as much as she likes the Shirley Temple movies — which she has requested more of! 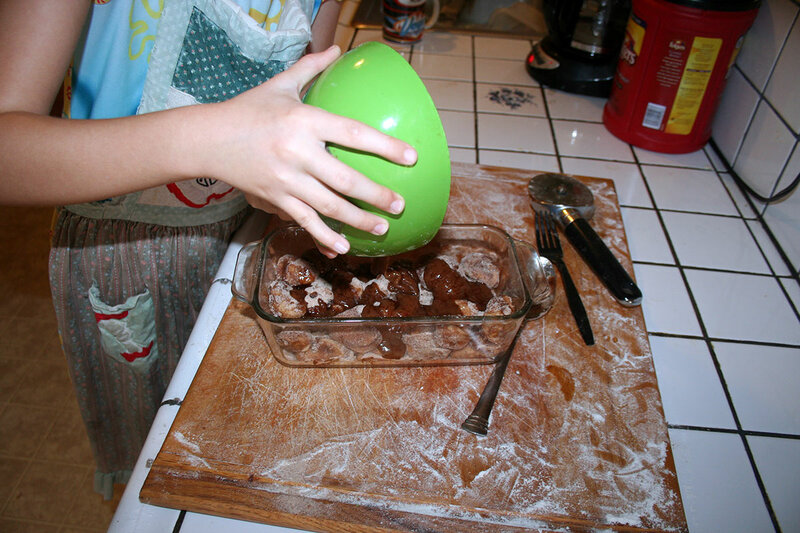 I move the frozen dough to a floured plate and put it in the frig the night before. I take it out and let it warm on the counter for a couple of hours before we start. Amara’s job is to thoroughly mix the sugar and cinnamon together and you know she loves doing her job! These pictures pretty much tell the whole story! Let bread rise for about 45 minutes - it gets big! Flip it on a plate and enjoy! This memory was posted in Indoor Fun and tagged Amara, baking, Grandma, monkey bread on October 27, 2011 by Grandma Kc. That looks so delicious! And how much moreso with all the joy that is baked into it also! What a wonderful time. Thanks for sharing! 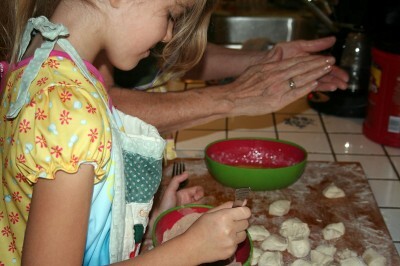 Thanks for the great post- as a new Grammie- I look forward to baking with my granddaughter! What wonderful pictures, thanks so much for sharing them with all of us. 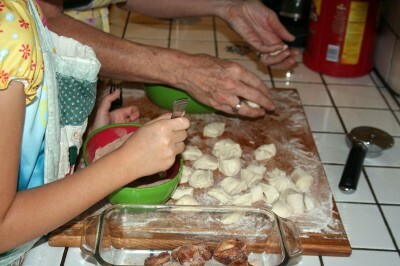 Like Lorene, I am a new Grammie too, and look forwar to making Monkey Bread with my grandchildren. I think is so wonderful that the grandmothers that are responding to your entry are excited about cooking with their grandchildren! What a wonderful tradition we are all carrying on. My grandson and I baked a pumpkin pie this week and now we just might try Grandma Kc and Amara’s Monkey Bread! And tell Amara congrats on the special school award! Looks delicious and Amara looks so excited. 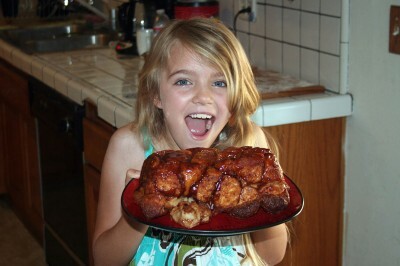 Amara is adorable, and the monkey bread doesn’t look too bad either. MMM,I need a bite of that. That looks delicious! 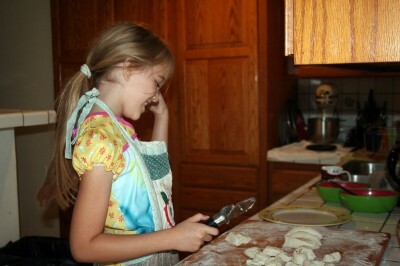 Amara’s going to be the next great cook in the family!! I can’t wait to try this with my grandkids!! Monkey bread is a tradition in our house, too….on Christmas morning after stockings. You two have so much fun together!! 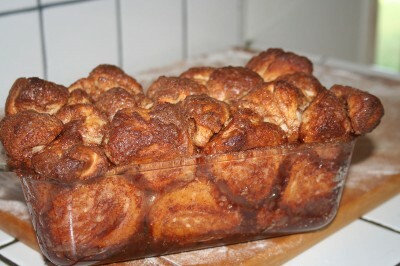 I was wondering what in the world monkey bread could be. I see it’s similar to what we call a pull-apart! My friend makes it in a bundt pan, and when you turn it out of the pan it’s in a ring! Yummy! Hi Nita, I don’t think there is much difference between monkey bread and pull-apart bread. 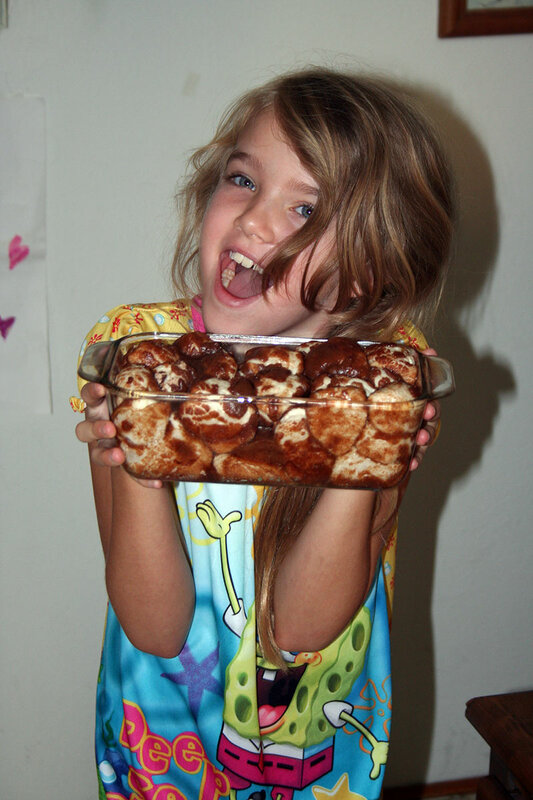 Amara and I have tried a lot of different monkey bread recipes and some of them call for a bundt pan — but they pretty much the same! Cooking breakfast together has become one of our favorite things to do so we are always on the look out for good new recipes. Thanks for stopping by!